With so many beautiful bathroom makeovers floating around on the internet, honing in on a particular style that is right for you can often be harder than the actual renovation process. From a classic black and white color palette to paint choices and bold wallpaper — the options are literally endless. Start by taking a look around the rest of your house and choosing a theme that matches your home's established style to ensure your design flows seamlessly from room to room. Still not sure which direction you should go in? Don't fret. Here are 9 themes you should consider for your bathroom's next makeover session. You can thank us later. Keep your bathroom timeless with a black and white design. 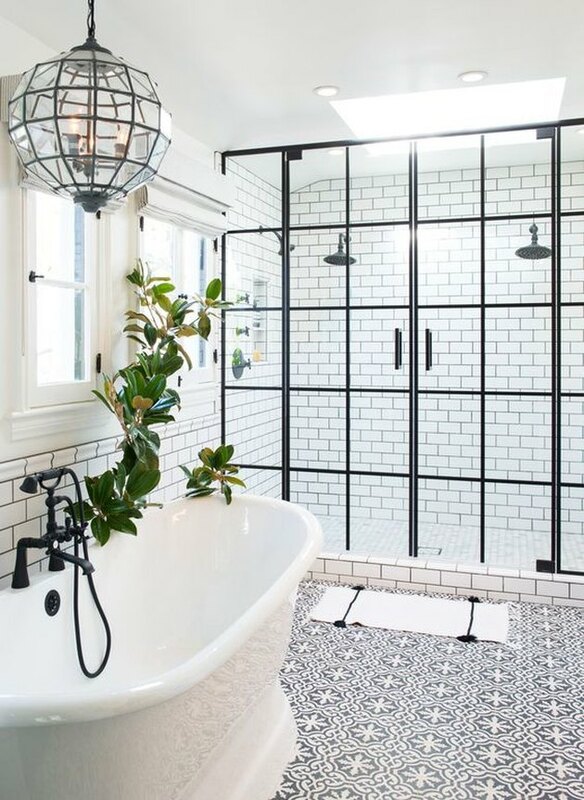 When doing renovations on your bathroom, make sure your design is timeless by sticking to a classic black and white color palette that will never go out of style. The freestanding tub and patterned cement tile are elements that take this space to the next level. Go for a modern-meets-vintage vibe. 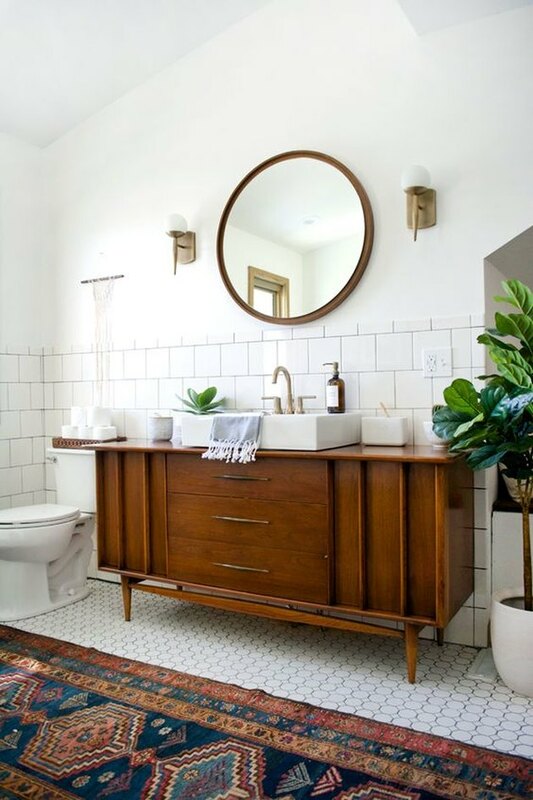 Retrofit an old credenza to be your bathroom vanity and pair it with trendy accessories like a kilim rug, brass fixtures, and a raised sink for the perfect blend of modern and vintage. This eclectic space from Bre Purposed uses the vanity to add warmth and carries the natural look throughout the room with the round wood-framed mirror and fiddle leaf fig. Use crisp white and tranquil blues for a spa-inspired retreat. Transport yourself to a luxurious high-end spa every time you step into your bathroom. Pull inspiration from this tranquil design by Caitlin Wilson and keep things clean and minimal. The blue tones of the rug compliment the ocean-themed prints on the wall and make this a space you'll look forward to unwinding in after a long day. 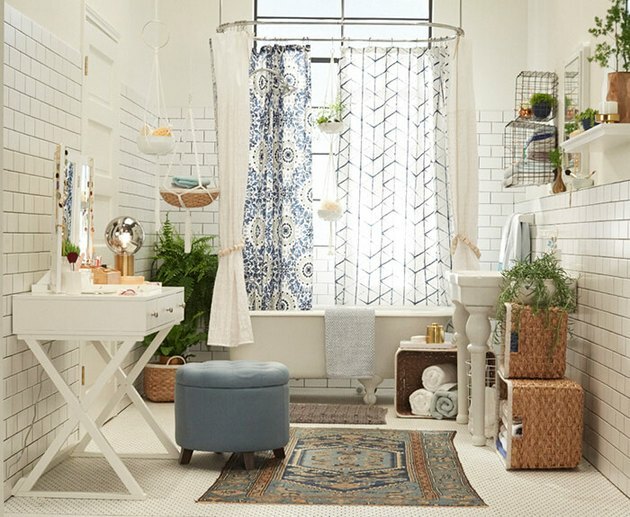 Create a beautiful bohemian bathroom by layering patterns and textures. More is more when it comes to this bohemian bathroom designed by Emily Henderson. 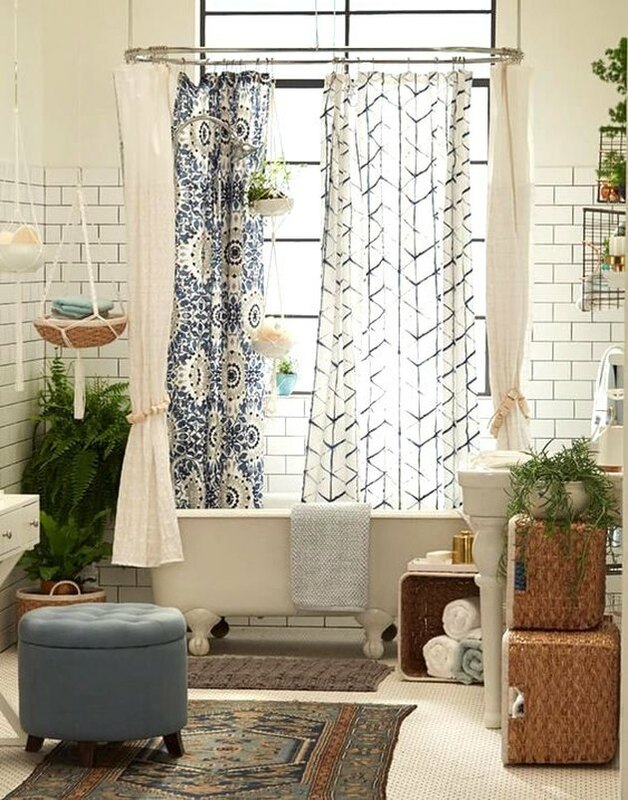 The small bathroom feels warm and inviting thanks to the layers of pattern and texture brought in via the multiple shower curtains, rugs, and woven baskets. And you can't forget the lush greenery — that's a definite must in this design. 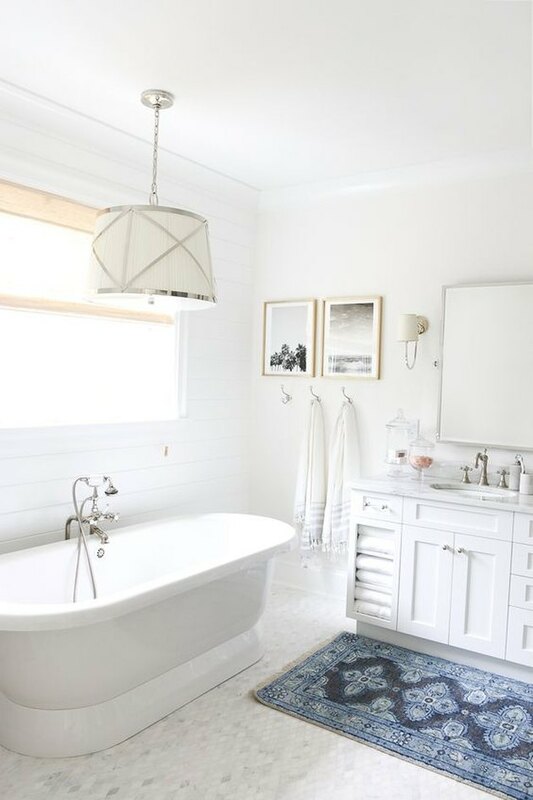 Stick with an all-white color palette for a versatile bathroom. 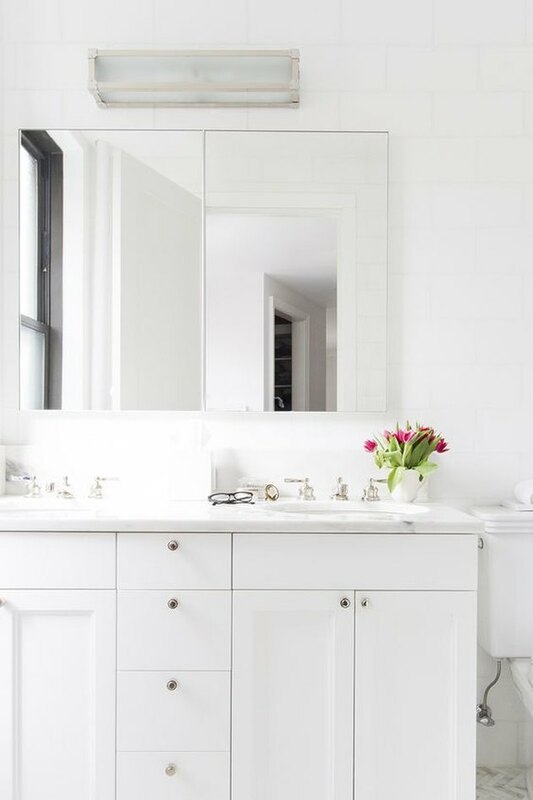 Make sure you always have a clean slate by opting for an entirely white bathroom. By keeping things on the lighter side of the spectrum, like this bathroom by Lilly Bunn Interiors, you'll be able to easily incorporate pops of color and different decorative elements as the trends come and go. With this white bathroom, you'll always be ready for the next big thing. 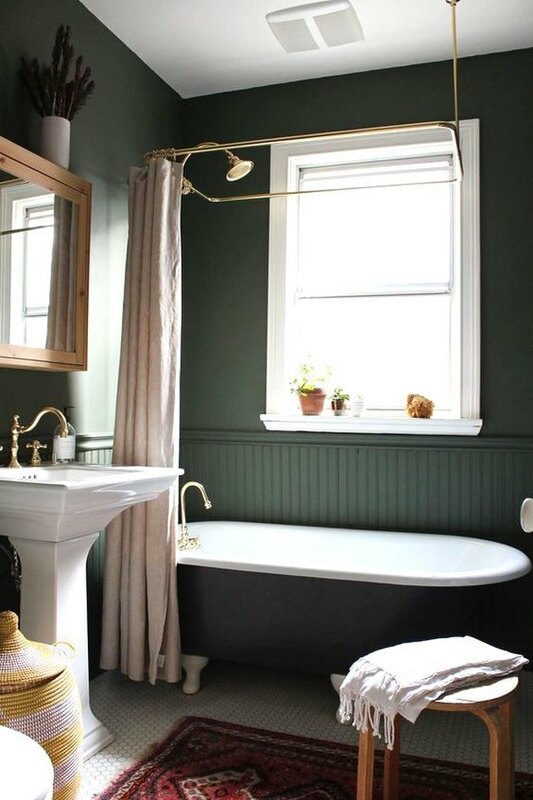 Pick a bold paint color to make a small bathroom stand out. If you've been itching to use a bold paint color somewhere in your house, but don't want to darken your otherwise bright and airy abode — start with the bathroom. The tight quarters of this space by The Marion House Book are just the right size to make a statement through the paint color. Just be sure to keep the rest of the fixtures white (or light colors) so they pop against the dark walls. 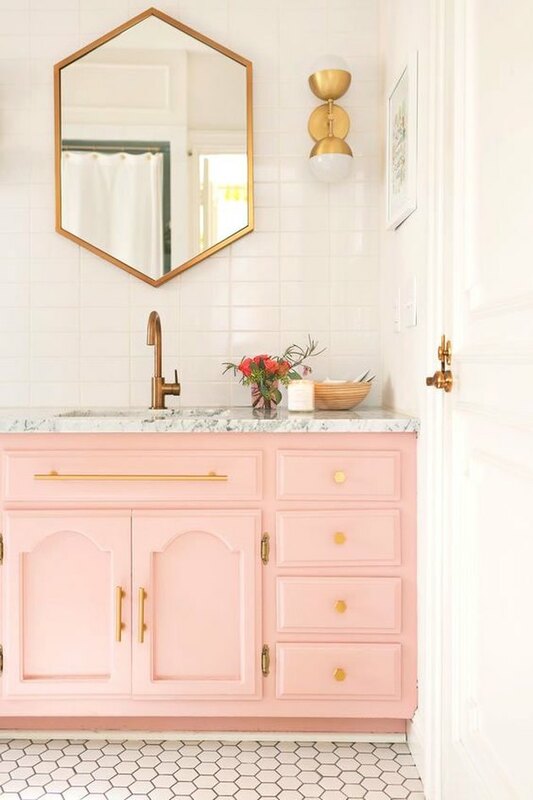 Give your bathroom vanity a feminine makeover and follow in the blog A Beautiful Mess' footsteps by painting it a beautiful shade of millennial pink. The swirled marble counter top offers a smooth transition between the stark white subway tile and gray and white hexagon tiles on the floor. Fresh cut flowers and a scented candle are like the bow on this very pretty package. Go for a patterned bathroom. 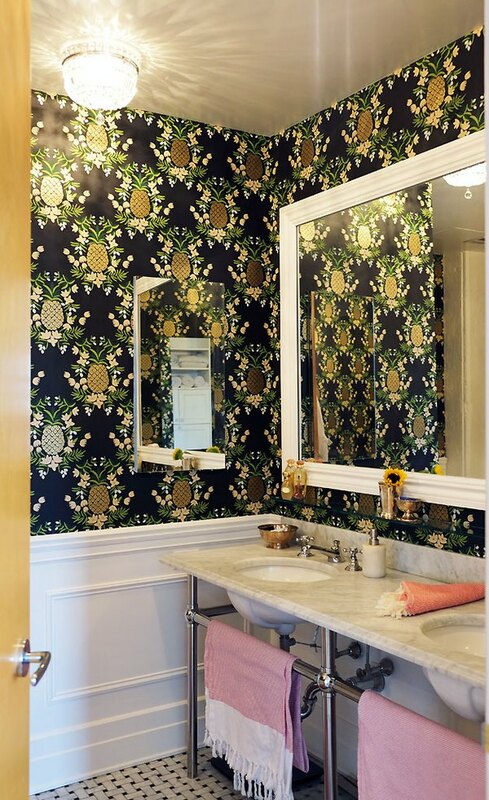 The pineapple print on the wallpaper in this bathroom by Daniel Kanter is playful, but the dark colors keep it from coming across as childish. By only doing the top half of the wall and keeping the other elements of the bathroom bright white, this space has a sense of balance and doesn't feel too busy either despite its small size. Combine Luxe fixtures and white tile for a modern minimalist masterpiece. If minimalism is your thing, then this bathroom by Sarah Sherman Samuel is right up your alley. 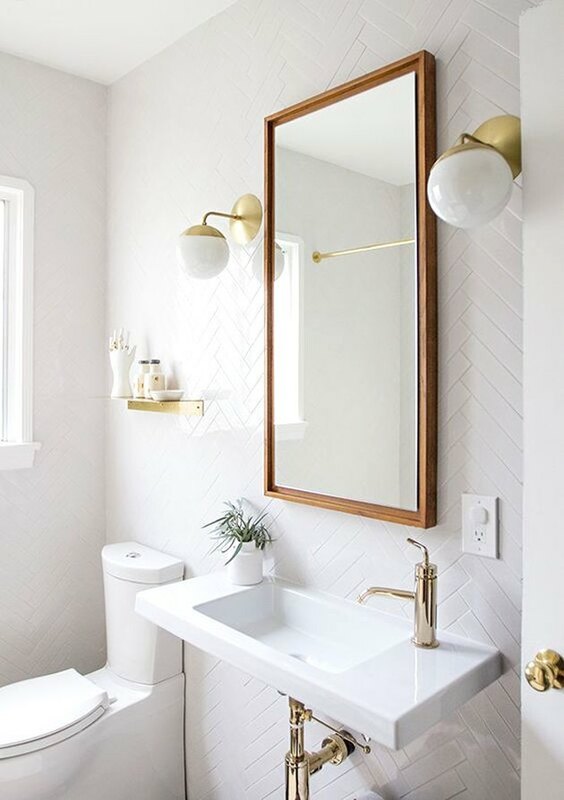 By combining white-on-white subway tile with chic accents like the exposed brass pipe under the sink and the sconces on either side of the mirror, the bathroom will keep up with your running minimalist theme.